Wesley Sutliff, Product Manager, Media Vision USA, Drills Down on Why Sound Reinforcement Matters So Much in Commercial AV Systems. 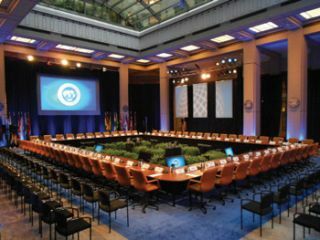 An IMF & World Bank Spring meeting featuring the TAIDEN HCS-4331 microphone system from Media Vision.Ask a movie director and they’ll tell you that the audio track is worth just as much if not more than the visuals on the film itself. The film industry learned a long time ago that without quality audio, you might as well be watching a silent movie. Why should your meeting be any different? Attention to sound reinforcement is just as important, if not more important than the visual content in your conference call. Why? Because your ears will struggle to hear the human voice through the noise of a bad system (speaker phone in the middle of the conference table? ); that struggle will make conversation difficult, at best, and ultimately cause fatigue. By implementing a well-designed sound reinforcement system you are encouraging better conversation and efficiency in your meetings. Amplifiers: The signal from a microphone is too weak to be of use over long distances (even across a small board room); the signal is amplified to make it louder and capable of traveling further. Digital Signal Processors (DSP): These are the devices in a sound reinforcement system that will shape the signal and enhance the quality. Common DSPs can include equalizers, compressors, and limiters and truly add great quality to the sound of the person speaking. Speakers: In a conference room these are often found in the ceiling or placed into walls and they turn the electrical signal from a microphone back into air movement that your ear can understand. Putting all of these together in a basic sense will give you a sound reinforcement system, and by definition that speakerphone in the middle of your conference table qualifies as a sound reinforcement system. So what makes the difference in a sound system is the quality of the components, their location in the room as it relates to where the meeting participants are sitting. A standard conference microphone system incorporates all of these components into one neat package with minimal cabling requirements. In the end, your sound reinforcement system needs to do one thing—provide intelligibility. If you cannot understand what someone is saying, if their voice is distorted, if there is an echo or distracting noises, than the system has not met up to your needs. Your meetings are suffering because of it. There are some best practices to consider while improving a sound system. • Acoustics: With the right acoustics you can achieve audio bliss, but short of dropping in an amphitheater next to the water cooler you’ll want to focus on a more subtle approach to gain a better acoustic environment for your meetings. • Try to avoid a rectangular room. Have you ever been on a call and it sounds like the person is in a well? This is why: if your meeting room is a rectangle, (or any room with large parallel walls) furniture can be used to stop sound from bouncing back and forth. Acoustical wall treatments are also available to assist. • Don’t point a speaker at the microphone (or vice versa). It might have sounded amazing for Jimi Hendrix, but your conference call should avoid the painful feedback that is caused when a microphone hears the same signal it is sending. Instead, arrange microphones to point at the person speaking instead of at the ceiling. • Mute your microphone. The best sound reinforcement system is one you can turn off when it is not wanted; like when you need to have a side conversation. More importantly though, muting your microphone guarantees that the sound reinforcement system will NOT pick up unwanted noise; it won’t pick up anything… because it is muted. In fact the only microphones that should be active are the ones being used by someone who is speaking. Think about it – would you prefer to be in control of when your microphone is live, or would you prefer to give up this control and take your chances that your side comment is recorded or worse yet live streamed onto the internet? • Auditoriums: Even if your auditorium has achieved the acoustic excellence of the Greek amphitheater, modern needs for communication extend beyond the lecture hall. A guest lecturer or remote professor mean that two-way communication beyond the physical limitations of a space is required and much like the boardroom examples above a sound reinforcement system will greatly assist the efficiency of this task. Also, by adding a “request to speak” model of microphone, like the TAIDEN HCS-4327D, for each student means that the professor/moderator will have complete control over who is speaking and still be able to capture the studio signal for distribution to the far end (and any lecture capture or recording devices). • Courtrooms: Forget about a courtroom movie references; real world technology demands in a courtroom have grown faster than the bill from your lawyer. On the visual side, that means the ability to view evidence and describe what is being viewed. And for audio, the sound reinforcement system not only includes simple amplification, but features sound masking for the jury, wireless assisted listening for the hearing impaired and language interpretation throughout the system. When looking at a sound reinforcement system for the courtroom, keep in mind that your system cannot just accomplish these features, it must do so simply and be operated by both technical and non-technical people alike. • Portable Solutions: Sometimes you will need an impromptu meeting, but will not have a permanent location to hold it. Portable sound reinforcement systems are easy to work with and can offer many of the same features that their permanently installed cousins can provide. This is an arena that “push to talk” conference systems can really shine; they offer easy setup and tear down. The portability factor means that they will be great for panel discussions, council sessions, or just a quick meeting on the go. Every meeting is important. Collaboration, clear communication, and teamwork are what have allowed all of us to succeed. When you increase intelligibility you will increase meeting efficiency, every time. Wesley Sutliff is the product manager with Media Vision USA. He can be reached at wesley@mediavisionusa.com.